NY NJ affordable marketing company www.MarketToRiches.com is a marketing consultants firm that will help you grow your business with a full range of B2C and B2B marketing services including strategic planning, branding, traditional and online marketing, video marketing, web site development, SEO & SEM, social media marketing, blogging, publicity, advertising, newsletters, brochures, speaking engagements, and special events. 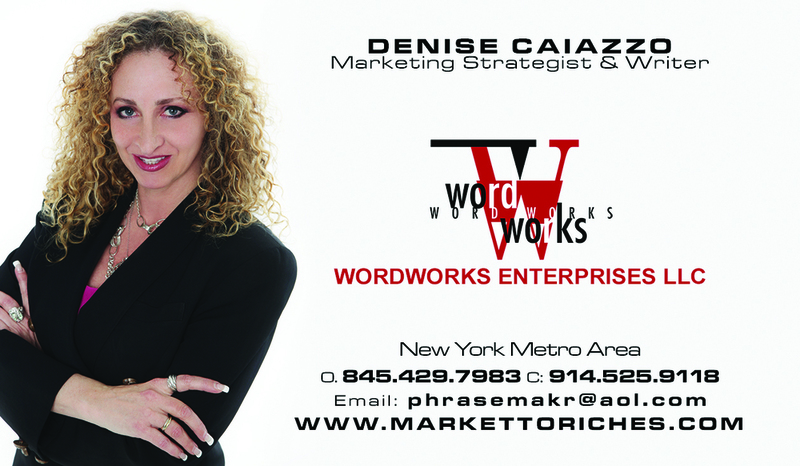 Based in the New York Metro area, affiliated with WordWorks Enterprises LLC and owned by Denise Caiazzo. Call 845-429-7983 for a free marketing consultation. Our experts are your marketing go-to team, ready to move your company into a dominant position. When you work with us, you have access to a full team of experts representing all of the communications-related disciplines in both the traditional and social media marketplaces. We have the depth and diversity of experience to quickly identify your key challenges and respond with tailor-made marketing communications solutions that will powerfully move you forward towards your business’ end goal.